YOUR UNSUNG HAIR HERO - Why spend time and money searching for the best hair styling products, and then skimp when it comes to your brush? It's time to toss that well-loved, well-worn brush that's been sitting in your bathroom for years, and to discover the Osensia difference. Whether you're drying or styling, this brush is up for the challenge. 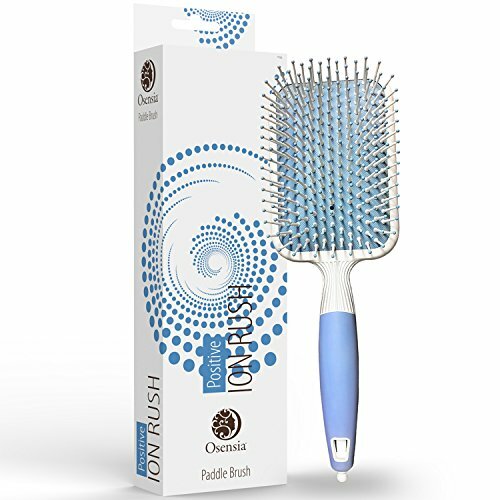 A BRUSH WITH BEAUTY - Creating straight, smooth, stunningly sleek styles has never been easier when you're armed with Osensia's flat paddle hair brush. Heat resistant, antistatic nylon bristles glide through all hair types, while round ball tips gently massage your scalp. But that's not all! The ergonomic, soft grip handle fits comfortably in your hand, and the section pin tip gives you even more drying and styling versatility! SOMETHING EXTRA - This isn't your typical paddle hair brush. Osensia infuses ionic minerals into each and every bristle to promote healthy hair and natural shine for truly radiant strands. Don't just brush away tangles, brush on brilliant hair. BELIEVE IN BETTER - Prepare for your hair to dazzle when you style it with Osensia's hair brush detangler, but why stop there? Prep your hair for maximum shine with our Hydrating Shampoo and Conditioner. Protect, hydrate, and define with our wide range of styling products, and put on the finishing touches with our Professional Hair Dryer. OUR PROMISE - We know you'll love your locks the first time you use our paddle brush for blow drying. But, if you're not impressed, that's ok. You're backed by our Osensia 100% satisfaction guarantee. No matter the reason, we'll gladly refund or replace your styling brush - no questions asked. If you have any questions about this product by Osensia, contact us by completing and submitting the form below. If you are looking for a specif part number, please include it with your message.